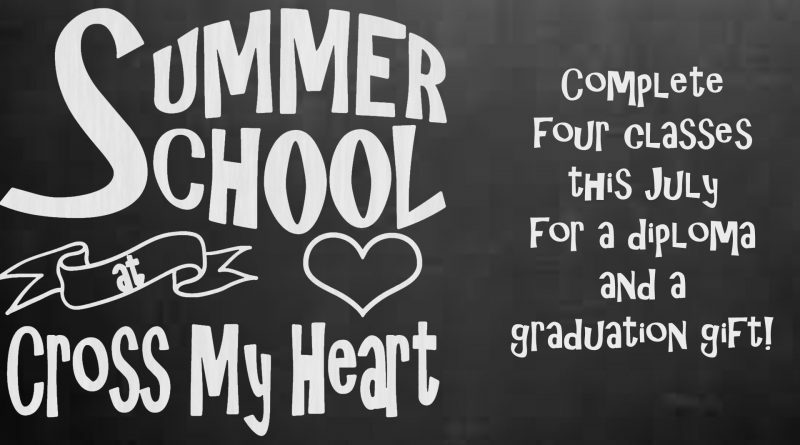 Try something new this summer – come to Cross My Heart’s Summer School! We have over 9 classes this June and July in our schedule – some new, some favorites and some just plain fun. We are offering an incentive to you this summer. Take 4 classes from the class list below and receive a diploma and a special graduation gift, hand crafted by Notthemama! 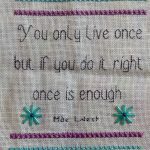 Come learn this great fiber art! It’s a great way to use up threads and you can make pictures for framing, ornaments for hanging, pillows for throwing or just about anything you can imagine. All supplies provided; you may purchase needles following class. Class is $20; RSVP 1 week prior to class time. Let Jennie hook you up with the basics of cross stitch. You will learn how to read a chart and transfer that pattern onto your fabric. Great way to learn some new tips and tricks. For example—did you know there is an arrow on the end of a skein of DMC that shows you what direction to pull? Already know how to stitch but want to teach a friend? This is a perfect class for the buddy system! We’ve seen ’em – the cute craft ideas on facebook, Pinterest, and in magazines – and thought “I can do that!” But can we really? This is a first in a series of Pinterest Win/Fail Make-It Take-it (Trash-It?) classes where we are going to try some of these ideas. The first project? Painting with buttons! If you have buttons you want to use, bring them – but all class materials will be supplied. Bring your creativity! Looking for a way to dress up ornaments, pillows and other finishes? Let’s try some cording and tassels! You will receive instruction and supplies to finish several great tassels as well as a cording drill kit. Please sign up by June 16 so that we have enough time to order enough cording drills. We will provide thread to make your sample tassels and cording; however, if you have a special thread that you want to use—bring it along! Jennie took this great class with the Thistles designer at Nashville Market this past March and loved how easy and quick these were to make. These stitched delights make cute gifts for you or someone special! Know how to stitch on linen (or need a refresher)? Want to move beyond the basics and learn some new stitches? This class is for you! Learn a few new stitches and learn about our year long Sampler Club. 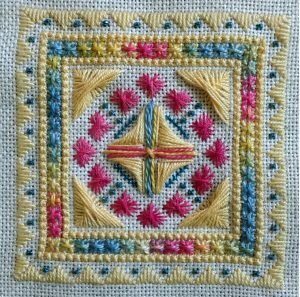 This stand alone class includes all the materials to complete a small band sampler. Previous Sampler Club attendees are encouraged to attend, especially if they want to participate in the new year. This Mani di Dona design features a beautiful flower top stitched with Gloriana hand dyed silk. 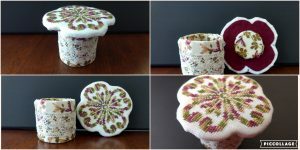 We’ve picked coordinating fabric and lace to complete your box and lid in class. A small pair of scissors is included in class cost. HOMEWORK—you must stitch the project ahead of time; kits available June 30. We will be making the box and lid in class. Limited to 6 students. Ready to tackle an advanced linen project? This is a perfect way to do it. We’ll be taking Freda’s Fancy Stitching’s Just a Wee Project and making it into a great Summer project. You will learn 4 stitches to complete this 4 inch project. Great for a box topper, pillow or framed! Class will include fabric, fibers and instructions. Make sure to RSVP at least a week prior to class. Spend a day finishing 3 great projects. Project 1—a cute magnet. Project 2—a gift card pocket that doubles as a hanging ornament. 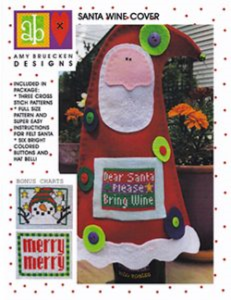 Project 3—a Santa hat wine bottle cover—you supply your own wine! Your HOMEWORK kit (available July 1) will include everything you need to stitch the 3 patterns and your finishing kit will include all the materials to complete the 3 projects into unique gifts. We’ll also provide a box lunch with water or iced tea. Not to miss! Limited to 12 so sign up quickly.